I have a great dad. 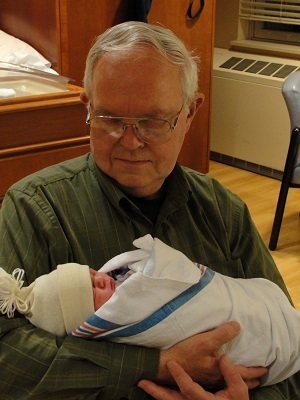 My dad is now a great granddad, which reminds me that I have a great dad. My dad did the ‘providing for the family’ thing working hard at his unglamorous job. But I only remember a handful of times that he brought it home. When dad got off work, it was family time. That is a lesson to me. My dad was my Webelos leader. He was my soccer coach. He was my chauffeur going to church, youth group and choir events. He was there when I graduated from high school, college and seminary. He danced at my wedding. With my mom, he was there when my daughter was born. Now he’s being a great husband while my mom lives it up with the UMW. He could have done none of this had he stayed at the office his whole life. I find myself wanting to be home in time for supper and ruing the times I miss bath and bed with A (which will be 4 times this week). Not everyone has a great dad. Our world and our church is full of I-don’t-know-my-dad pain. How do dads without dads know how to be dads? Many figure it out, which is a miracle in its own right. Luckily, I don’t have to look far to find a good dad. My plan is that my kids won’t have to look far, either.